The first place we will start is treadmills. They are the most popular gym equipment found in homes and are typically used as an extra closet for those clothes you wished you forgot you had. With so many treadmills available, it can be very hard to figure out which one will be best for you. So, here are some guidelines to follow to help make the decision process a little easier. You will want a larger motor if you plan on running, using interval training, have multiple users or have a heavier user 200lbs+. Continuous Horsepower is the key measurable for motor size, but the quality of motor comes into play as a better motor will run cooler and at a lower RPM which is the key to motor longevity. If you just walk then almost any size motor will do but if you plan to jog or run an inexpensive treadmill will break down if used regularly. Also, keep in mind what you plan on working yourself up to, as you may only jog today but is it your goal to run? You will need a longer deck if you plan on running at faster speeds 6mph+, are a taller user 5’10”+ or have a tendency to utilize the backside of the belt during your workout. 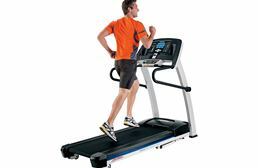 Most treadmills are 20” wide now and very comfortable for 90% of all users. If you are broad shouldered, very tall, or tend to veer side to side while running then consider a 22” belt. The best treadmill is the one that you use so make sure you choose a unit with the programs, feedback, and tracking that will bring you back day after day. Most people use a manual program, but results will greatly increase If you learn to use Heart Rate control or interval programs. Understanding how well you perform and what you need to do to improve is key to progression and a treadmill with good feedback is key if it has tracking onboard or thru an app that is even better. TV’s and speakers can be great motivators, but most in home treadmill users already have those features in the room they are choosing to put their treadmill. 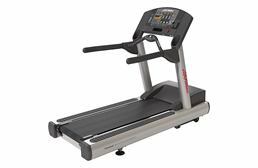 Please consider the space you will be putting the treadmill in during your purchase as entertainment options, ceiling height, noise levels, and convenience are all key factors in making your treadmill easy to use. Folding treadmills are a great space saving solution, but you do sacrifice some stability with many of them as they have a hinge point instead of a bolt or weld point at a key frame junction. 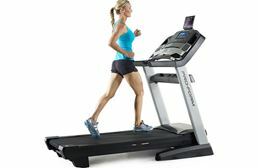 Some brands have significantly improved on this, and the LifeSPan TR4000 is a prime example of a folding treadmill that can handle a larger user at a running pace.